As his trial moves forward, Saddam Hussein appears to be aiming his remarks more at the world stage and less at the court, who he says has no right to judge him. The former Iraqi dictator also says he's not afraid of death. A woman whose identity will be kept secret was the first witness in the trial of Saddam as the fourth session of the trial resumed Tuesday in Baghdad's heavily guarded Green Zone. Chief Judge Rizgar Mohammed Amin told the court that defense attorneys will be told the identity of the witness but they must not pass them to anyone outside the tribunal. He said she would be referred to publicly as "Witness A." Witnesses have the option of not having their identities revealed as a security measure to protect them against reprisals by Saddam loyalists. The first two witnesses — both males who took the stand Monday — allowed their names to be announced and their pictures to be transmitted around the world. When the witness began to speak, defense attorneys complained they could not hear her because her voice was being distorted to protect her identity. The judge then ordered the voice modulator to be shut off — allowing defense counsel to hear her natural voice. People in the visitors' gallery and the press viewing area could not hear any of her testimony. Two women strapped with explosives blew themselves up in a classroom filled with students at Baghdad's police academy on Tuesday, killing 27 people and wounding 32, the U.S. military said. Defense Secretary Donald H. Rumsfeld said Monday the American public should be optimistic about the situation in Iraq, and not judge progress based on the death toll or media reports alone. Unidentified gunmen abducted a French engineer from outside his home as he was on his way to work Monday in Baghdad. The kidnappers in three cars surrounded the man as he was getting into a car outside a house in the wealthy Mansour district of Baghdad, police Capt. Qassim Hussein said. U.S. troops and Iraqi troops began an operation Monday in Ramadi, 70 miles west of Baghdad, to help "neutralize the insurgency" before the Dec. 15 parliamentary election, a U.S. military said. Before the woman's testimony, Saddam's half brother and co-defendant Barazan Ibrahim and chief prosecutor Jaafar al-Mousawi got into a verbal tiff over the defendant referring to him as "comrade," in the style of Saddam's Baath Party. "I object to being referred to as a comrade," the prosecutor complained. Ibrahim replied: "The word 'comrade' is very noble and dignified. You are my comrade and I'm very proud of you." Monday, Saddam told the chief judge at his trial that "I am not afraid of execution" and seemed to threaten the judge during an unruly court session in which the first witness took the stand and testified that the former president's agents carried out random arrests, torture and killings. The outburst was one of several by Saddam or his co-defendants at the trial that also saw a brief walkout by his defense lawyers. At one point, Saddam appeared to threaten the judge, saying: "When the revolution of the heroic Iraq arrives, you will be held accountable." Chief Judge Rizgar Mohammed Amin replied: "This is an insult to the court. We are searching for the truth." Before the trial adjourned until Tuesday, Saddam repeatedly interrupted testimony and appeared to try to rally Iraqis against the U.S. occupation. Saddam also suggested that the first witness against him needed psychiatric treatment, then, after that witness finished testifying, he defended his actions and told the court that he understood the pressures upon it in his trial. He and his seven co-defendants could be executed if convicted in the deaths of more than 140 Shiites in 1982. "When I speak, I speak like your brother," said Saddam, making his point in court on Monday. "Your brother in Iraq and your brother in the nation. I am not afraid of execution. I realize there is pressure on you and I regret that I have to confront one of my sons. But I'm not doing it for myself. I'm doing it for Iraq. I'm not defending myself. But I am defending you." He added that: "I want you to be the shooters and the swords against the enemy army." "If it's ever established that Saddam Hussein laid a hand on any Iraqi, then everything that witness said is correct," he said. When the witness, Ahmed Hassan Mohammed, spoke out, Saddam told him: "Do not interrupt me, son." The witness earlier exchanged insults with Saddam's half brother and co-defendant, Barazan Ibrahim, telling him "You killed a 14-year-old boy." "To hell," the half brother, Ibrahim, replied. The testimony of the first witness was emotional, reports CBS News correspondent Cami McCormick He talked of killings and mass arrests following an attempt on Saddam's life in the mostly Shiite town of Dujail. He said he saw a days-old baby in the arms of its mother, who was arrested, and the bodies of his neighbors. He said the shooting went on for days. 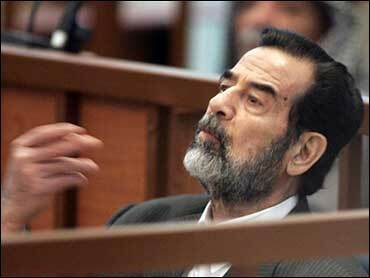 Saddam and his co-defendants are standing trial for the executions of more than 140 men there. "What's important is he's being held account for the atrocities he's been charged for," White House adviser Dan Bartlett said on CBS News' The Early Show. "Saddam Hussein was a terrible threat to the country, to the world, in the way he treated his own people. He's directly responsible for the death of tens of thousands of people in his own country and it's critical he be held to account." The court in the Saddam Hussein trial allowed former U.S. Attorney General Ramsey Clark and another foreign defense lawyer to address the session Monday, reversing a ruling that had led the defense to walk out. After a 90-minute recess, Chief Judge Rizgar Mohammed Amin allowed Clark and ex-Qatari Justice Minister Najib al-Nueimi to speak on the questions of the legitimacy of the tribunal and safety of the lawyers. There were other disruptions in the courtroom, reports CBS News correspondent Kimberly Dozier. Saddam Hussein jumped out of his chair many times to attack the judge, the court and the whole process, and calling it made in America. And a co-defendant yelled "Why don't you just execute us and get it over with?" "Reconciliation is essential," Clark told the court. "This trial can divide or heal. Unless it is seen as absolutely fair, and fair in fact, it will divide rather than reconcile Iraq." At that point the judge reminded Clark that he was to speak only about the security guarantees for the defense lawyers — two of whom have been assassinated since the trial began Oct. 19. Clark then said all parties were entitled to protection and the measures offered to protect the defense and their families were "absurd." Clark said that without such protection, the judicial system would collapse. Al-Nueimi then spoke about the legitimacy issue, arguing that court is not independent and was in fact set up under the U.S.-led occupation rather than by a legal Iraqi government. He said the language of the statute was unchanged from that promulgated by the former top U.S. administrator in Iraq, L. Paul Bremer, and was therefore "illegitimate."